Many people complain that life is just not fair. But actually, when you think about, that’s a good thing. The way to begin thinking about this is to ask ourselves what we had before God entered the picture; and of course, God entered the picture at the very beginning to give us life in the first place. Before that we had nothing at all. As long as we stay focused on where we began and realize that life itself is a gift, and birth is a sheer windfall for every one of us, then a spirit of astonishment and gratitude will never leave us. Before you complain to the Dealer about the hand that you have been dealt in life, you need to remember that if it wasn’t for the love and grace of God, you would not have been dealt any hand at all. When you forget that fact, and begin to make comparisons not to what you had at the beginning but to what someone else has, then the gratitude turns to accusation and grumbling, and faith and trust disappear. The ‘amazing grace’ of God isn’t only that your sins have been forgiven. Everything you have and everything you are, including the fact that you were even born, comes by the grace of God. There is no other source of anything. Depending then on my ultimate point of reference, the words “life isn’t fair” come to mean diametrically opposite things. When I remember the nothingness out of which I came and that life is gift and birth is windfall, then I say: “Of course life isn’t fair. It is all grace from beginning to end. To be alive at all is to be ahead of the game, and even to be born is an undeserved blessing.” But if my beginning point is a comparison to someone else, the words “life isn’t fair” take on a negative tone. The crucial issue is always the fairness or unfairness of life compared to what? The conclusions we come to at the end will be determined by where we chose to begin. I once knew a family who had a beautiful baby girl born to them who was normal in every way except she did not have arms or legs. There was no explanation for this genetic abnormality. However, instead of wasting any energy feeling sorry for themselves or for the child, this courageous and resourceful family set about to take her home and provide her with every advantage that they could. As a result, she developed into a remarkably intelligent and interesting human being. Her mind and spirit were highly cultivated, even though she was never able to move herself one inch, feed herself, dress herself, or do any of the things that the rest of us tend to take for granted. Here was a person who learned the secret of staying focused on the astonishing fact that all of life is a gift. 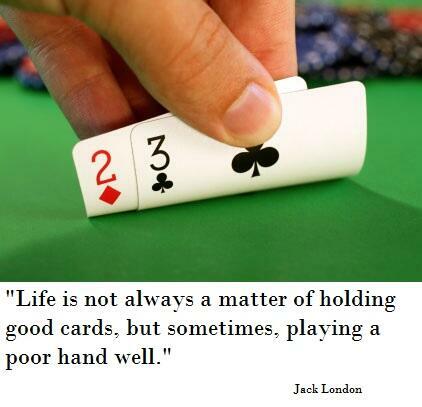 Playing the hand I’ve been dealt, grateful to just be in the game, is far more important than comparing myself to other people and being jealous of the seemingly better hands they have been dealt. This is why we should thank God that life isn’t fair. You see, it all begins in grace, not in entitlement, and staying close to this single fact is the best resource I know for making both the best and the most of the particular hand each of you have been dealt. So what are you looking at: your neighbors’ blessings, with envy; or your own, with gratitude? Job 1:21-22 — (Job said), “Naked I came from my mother’s womb, and naked I will depart. The Lord gave and the Lord has taken away; may the name of the Lord be praised.” In all this, Job did not sin by charging God with wrongdoing. Psalm 139:14a — I praise you because I am fearfully and wonderfully made. Psalm 8:3-4 — When I consider your heavens, the work of your fingers, the moon and the stars, which you have set in place, what is mankind that you are mindful of them, human beings that you care for them?